Laundering bedding is one of my least favorite chores. Being a family of six, we have quite a bit of bedding and adding this into my daily laundry creates a mountain of blankets once a week. What a lot of people do not realize is that it is not only the bedding that need to be washed, but pillows really need to be cleaned as well! I know, who wants more laundry?! I think most of us would answer, "Not me," but if this is not already a part of your routine, it should be and it's so very worth the end result. The first thing you will need are your pillows. Check the tag and be sure that they are machine washable. I never launder down pillows at home. I take anything with down to the cleaners and I try to do that as little as possible. Also, I learned the hard way that foam pillows are not wash friendly either. Foam pillows get incredibly heavy when wet and after saturating them there really isn't a way to effectively dry them to keep them from getting mildew or mold. Though I love the feel of a nice heavy foam pillow, I don't buy them anymore since they cannot be properly cleaned. So after verifying that your pillows are washable, you will wash them in pairs. This will help keep your washing machine balanced. As you fill the washer with hot water, be sure to add in a natural liquid laundry detergent with a cup of baking soda, and some white vinegar in the fabric softener dispenser. 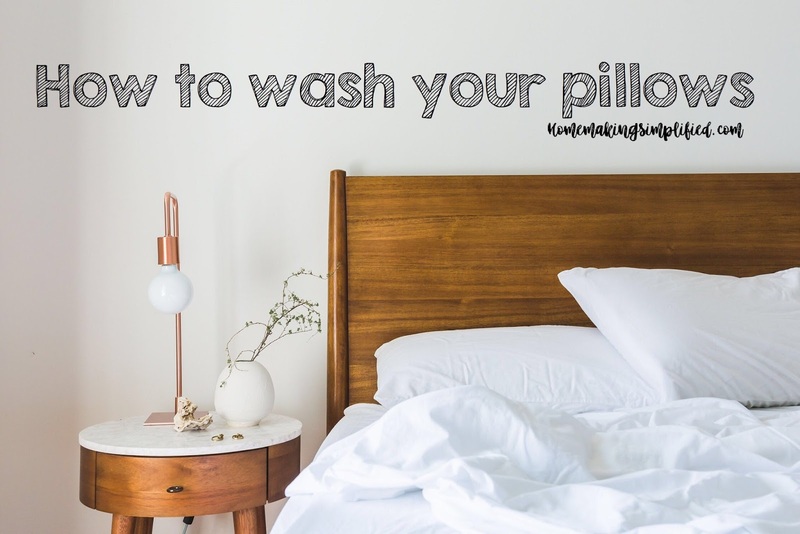 If you are using a top loading washer, you can soak the pillows for a bit to help break down oils that may have made its way through pillow cases. You shouldn't need to soak your pillows regularly. Run your wash with an extra rinse to ensure all of the suds are out. Some people recommend letting pillows air-dry, but I love putting mine through the dryer. This is what makes washing pillows worthwhile. I dry them (once again in pairs) on medium to high and they come out so fluffy! I use wool balls in all of my dryer loads and they do not disappoint when it comes to drying pillows. Washing your pillows regularly keeps them from getting stained and discolored by body oils, keeps dust mites away, makes them feel and smell fresh, and renews their fluff!